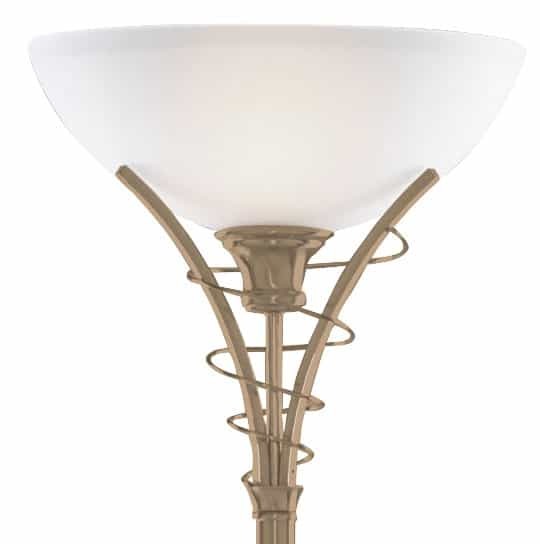 This Linea antique brass floor lamp uplighter with twist centre and opal glass is classic and traditional. The tall stand has a stylish upward facing opal glass shade at the top, surrounded by three decorative curved arms and a spiralling twist of antique brass. The opal glass shade creates a subtle lighting effect and bounces light off the ceiling in any corner of your home. Part of the Linea lighting range, an antique brass finish floor standard lamp uplighter, with opal white glass shade. I have broken the shade for the Linea antique brass floor lamp Opel glass shade can I get a replacement shade or is there a place that does these and how much is cost. Many thanks. We are able to supply replacement shades for these floor lamps. Please contact a member of our sales team who will be able to advise costs and delivery.